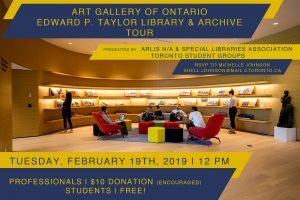 Join UofT Student Groups for ARLIS/NA Ontario and the Special Libraries Association-Toronto on a tour of the Art Gallery of Ontario’s E.P. Taylor Library & Archives! See art librarianship in action with this behind-the-scenes glimpse at one of Canada’s top art galleries. Tour to take place on Tuesday February 19 at noon, with lunch to follow at the Village Idiot Pub. Free for students, and $10 donations encouraged for professionals.